The Pension and Social Security Authority reported that a pension is not a legitimate inheritance in accordance with the provisions and entitlements established by the Pensions Act, while the death benefit or benefit paid to the insured's relatives upon death is a legitimate inheritance distributed to the legitimate heirs. The Authority confirmed to Emirates Al-Youm that the death benefit is equivalent to three months of the pension that was paid before the death, in addition to the death month pension. The heirs of the insured who died before retirement are entitled to a payment of one payment estimated at 60 thousand dirhams, Six categories of the pensioner or the insured, the retirement benefit is payable in the event of the death of the participant, namely widows, children (males and females), brothers and sisters, fathers, mothers, husbands. In detail, the General Authority for Pension and Social Security stressed the need for the deceased pensioner or deceased insured to submit all data and documents proving their entitlement to the pension to the Commission immediately after the death, as this would expedite the procedures for the payment of insurance receivables due to them According to the provisions of the law. The Acting Executive Director of the Pensions Sector, Hanan Al-Sahlawi, said that Federal Law No. 7 of 1999 on Pensions and Social Insurance approved a death benefit or compensation to help the heirs of the insured or the pensioner manage their lives quickly, And to respond to the requirements of life once the death occurred, stressing that the rapid provision of the required data and documents required immediately after death by the beneficiaries who were supported by the pension and meet the conditions of eligibility, meet the purpose for which the grant or compensation. Al-Sahlawi said: "This subsidy is paid in one lump sum to the beneficiaries who were supported by the pensioner at the time of his death, provided that this subsidy is regarded as an amount that is not refundable and may not be seized in fulfillment of any debt. Also exempt from taxes and fees of all kinds, Due to the heirs of the following months of death, which are paid monthly by the Commission on due dates ». She added: "In return, the compensation paid to the heirs of the insured upon his death, a legitimate legacy, is distributed to the heirs legitimate, where the Commission referred him to the Shari'a Court provided provided under the pretext of limiting the legacy of the insured deceased," explaining that the pension is not a legitimate legacy according to Of the provisions and entitlements established by the Pensions Act. Sahlawi pointed out that the Authority calls on all eligible to update their data, and to provide the Commission with data and documents proving their entitlement to pension contributions, in order to ensure the disbursement of these shares to the beneficiaries as soon as the occurrence of death. The six categories are entitled "widows, children (males and females), brothers and sisters, fathers, mothers, mothers and fathers, Couples ». And stressed that these groups are most concerned to call upon the Commission to review them at the death of the pensioner, to pay the pension and distribute the shares in a manner consistent with the provisions of the law, stressing the importance of the obligation of the beneficiaries of the pension contributions, . "The importance of updating the data in cases of redistribution of quotas when there is any change in the status of one of the eligible, for example, if the share of the widow - if she earned a share in the pension of her husband - to her sons and daughters from him in the event of her death, She died and had no sons. " She added: "If the pension is cut in whole or in part from one of the children for the absence of a condition of entitlement, such as joining the work, his share will be transferred to the rest of the eligible sons and daughters of the pensioner. In the absence of eligible children, The share of the pension and the share of the brother or sister to their brother when the share of one of them retired in the pension for one of the reasons stated in the law », noting that changes in the distribution of shares are models that make updating data necessary to ensure that the funds properly to all eligible. 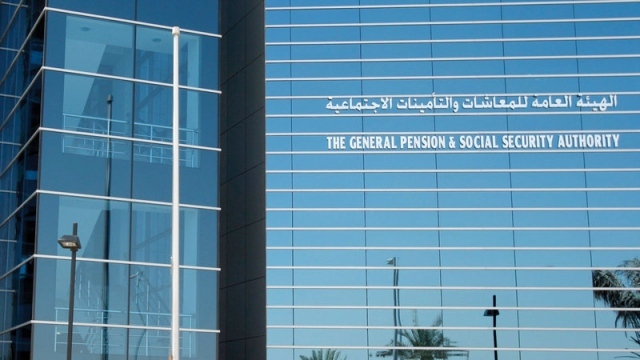 The Executive Director of the Pensions Sector in the General Authority for Pensions and Social Insurance Hanan Al-Sahlawi said that the Pensions Law was keen to establish the principle of solidarity in order to ensure a better life for present and future generations, because it is characterized by comprehensive and integrated goals and objectives, pointing out that this is evident in the Declaration The law provides for the right of the wife to share in the pension of her deceased husband, regardless of her religion or nationality, as well as the entry of children from non-citizens in the pension. She explained that the Authority is administering pension rations to non-residents of the country, but they have the conditions of entitlement established by law, which explains to what extent the federal pension law is generous, in addition to the symbiosis that protects the social construction of the family and maintains the stability of society.